The Wallace Folk recently went on an adventure to Townsville. Why Townsville? Mr Wallace had a work trip which was then cancelled. Our flights were booked and my dearest friend now lives in Townsville so we decided to go anyway. 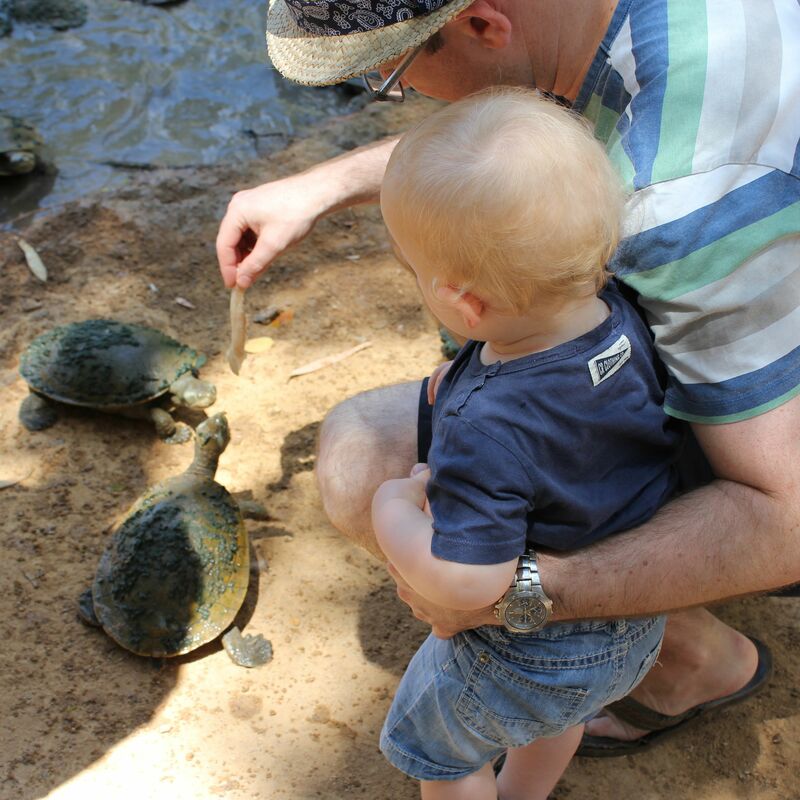 It might not be the most obvious tourist destination, but there are plenty of things to do in Townsville with kids. Here’s our top three! 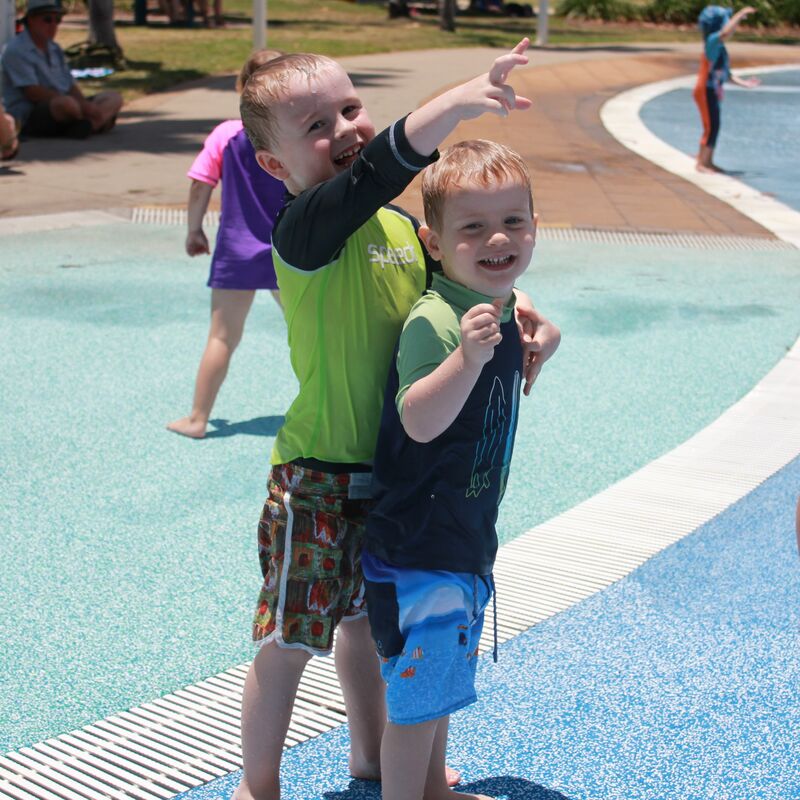 I’m sure my biggest boys would tell you that of the things to do in Townsville with kids, the best is The Strand Waterpark. 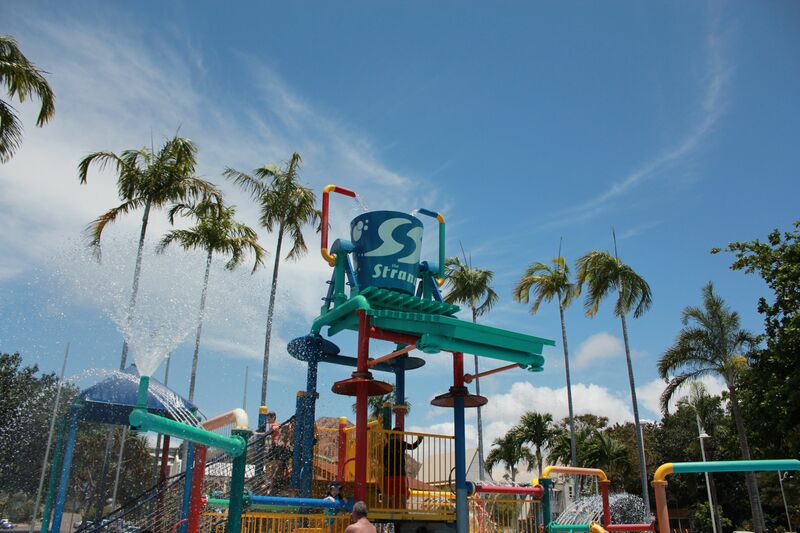 It’s a perfect place for kids to cool off and splash about. There’s a huge bucket that fills with water and then dumps on the kids. The big boys loved it! We were only in Townsville for three nights but managed two trips to the Waterpark. I would say that it’s more suited to kids who are 2.5 and over, there’s not a great deal aimed at little kids. The waterpark overlooks the beach, it’s a really picturesque setting. There’s lots of great places for ice-cream along The Strand, we loved Juliette’s. 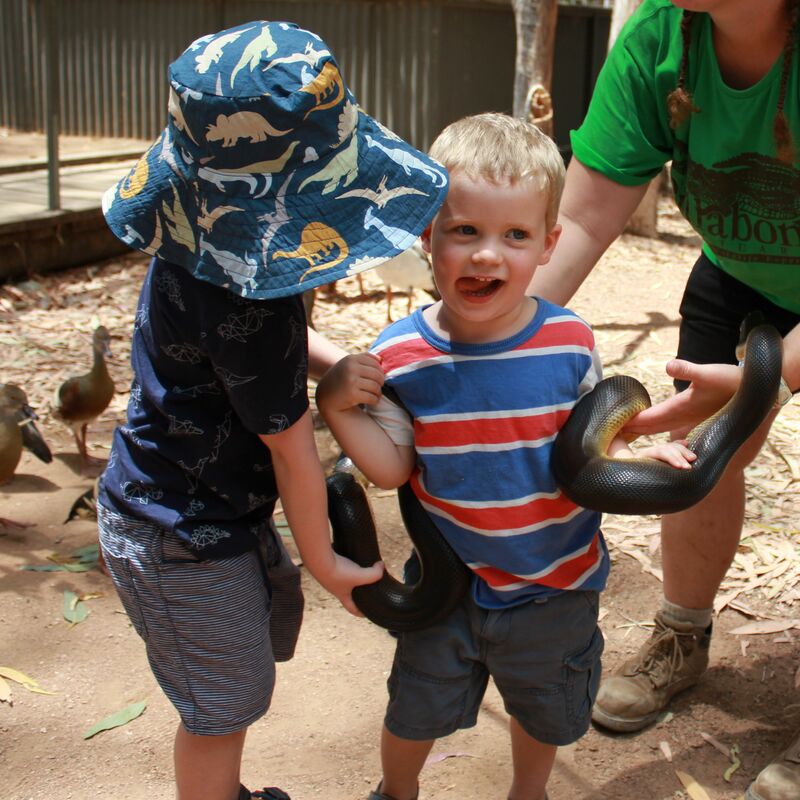 The Billabong Sanctuary was a huge hit with the boys. It’s a little out of town but well worth the drive. 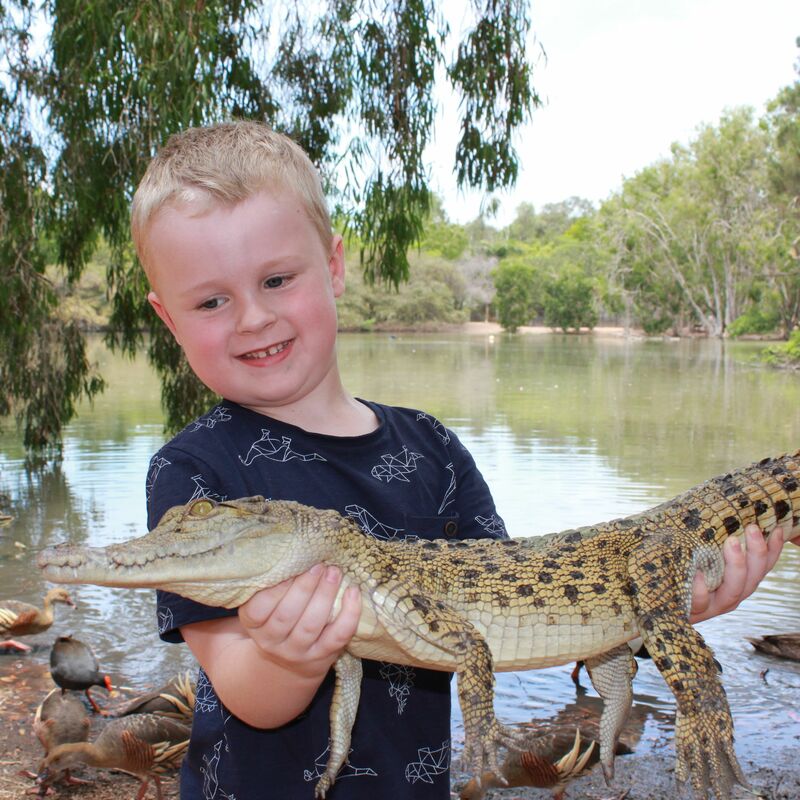 While the setting isn’t amazing, the real charm of the Billabong Sanctuary is the hands on access to the animals. We started with turtle feeding. The turtles literally emerge from the billabong at feeding time and you’re given little pieces of fish to hand feed them. Turns out turtles don’t have great eye sight, so keep your fingers clear! Friendly kangaroos roam free and are keen for a feed. There are plenty of animal talks about wombats, koalas, snakes and of course, crocodiles. While there are opportunities to pay for photos with the animals (like holding a koala), I was impressed that you can still pat a koala and wombat and hold both a snake and a crocodile as part of the admission price. There was no way I was going to hold a wriggly snake, but it was a laugh to hold the crocodile. Might was well get in on the action! Notice the biggest lad’s hat? We rescued it from childcare for the trip! 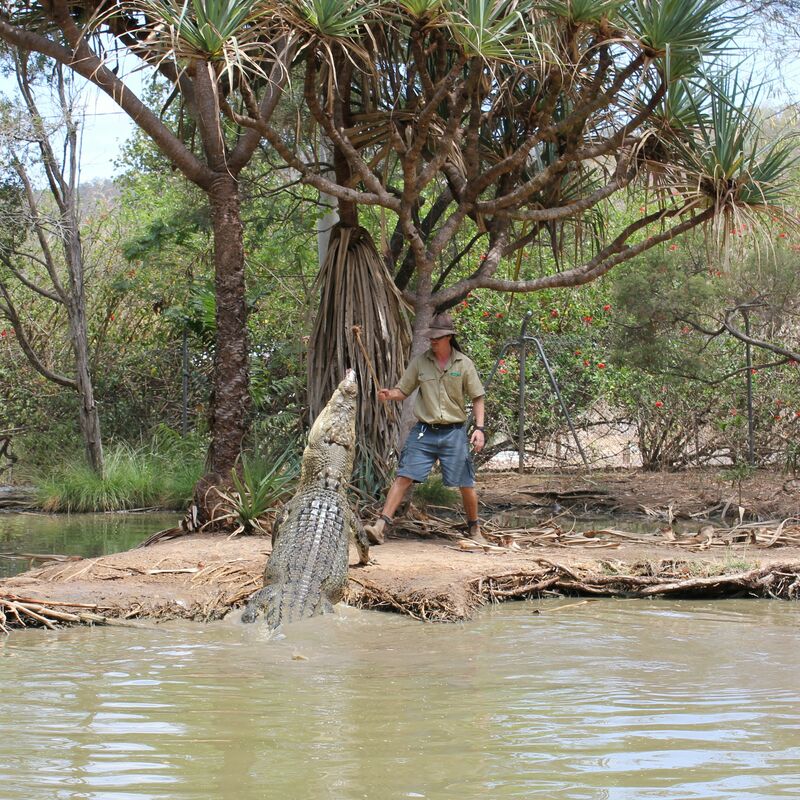 The local tip is to get to the Billabong Sanctuary early as it does get rather hot out there. We stayed until the crocodile feeding at 1pm and then called it quits. Reef HQ is a great indoor activity that is nice and cool. The tanks are shiny and clean and the fish are impressive. 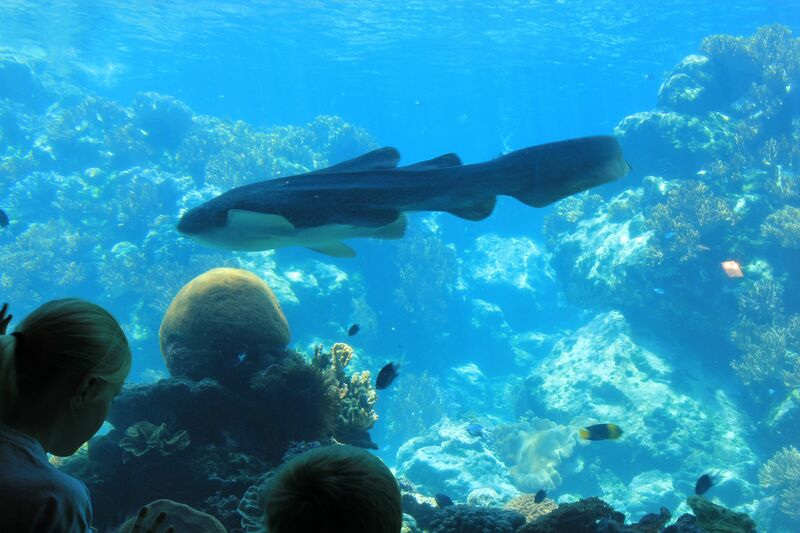 There’s turtles, plenty of vibrant coloured tropical fish, sharks and sting rays that swim overhead. I’ve never seen so many baby Nemo fish. The only disappointing thing is that the talks and fish feeding weren’t very well pitched at kids. While you are there, take a drive to the top of Castle Hill. 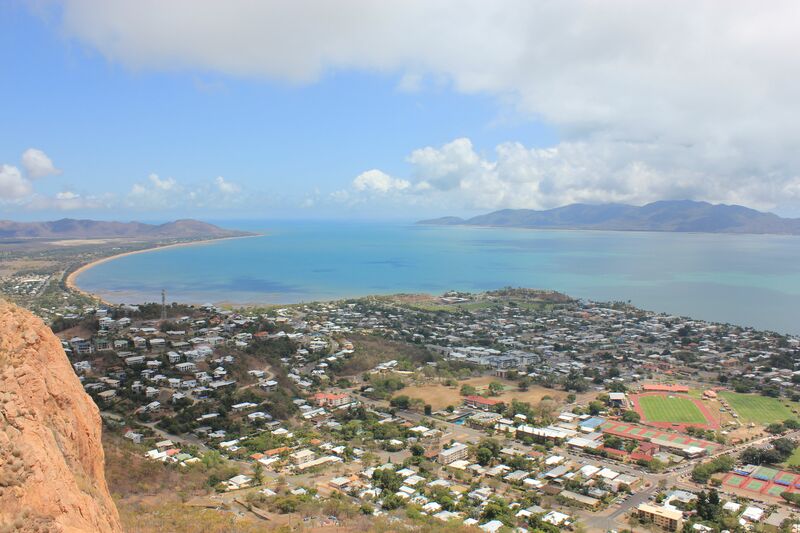 The views are lovely and it is a great way to get a feel for the layout of Townsville. Where to stay? While it was nothing fancy, we stayed in an apartment at Mariners North, which suited our needs. The location was perfect, a short stroll to the Strand, and the boys loved the pool. While not strictly on the list of things to do in Townsville with kids, you’ll need coffee to kick start your day. We experimented a little and decided the best option is Coffee Dominion on Stokes Street. Great timing, we just moved to Townsville 6 weeks ago so are still getting to know it. My girls love the Strand Water Park and we walked up to the top of Castle Hill on the weekend – very hot! We will head to the Billabong Sanctuary in the holidays and my just camp out at Reef HQ over summer to stay in the cool! Hope all is going well with the move Vicki. The Billabong is great, but I imagine it’d get rather hot out there! The Strand looks awesome! And always good to know where to get great coffee! I hate to say it Emma, but slim pickings for coffee! The big kid in me absolutely ADORES wildlife parks and you had me sold with that picture of your little fella holding that crocodile. AMAZING! Seriously, holding the crocodile and snake was a real buzz! It was great having you here, we loved catching up with you all. I’ll have to try that coffee place! We’ve got friends there too and while it’s not a ‘must see’ location I was impressed by what there was to see and do. Ooh, my tip is Tassie! You know that’s my home state? The Strand is super fun with kids. Our daughter had a blast at the water park back in September last year. But we also had a wonderful time visiting Magnetic Island for a day. We are hoping for a return trip in February for my cousins wedding… the next one in line since that was our last reason for visiting too. Thanks for linking up with SnapshotStory too! We’d have loved to head over to Magnetic Island but simply didn’t have the time. Next visit! Looks like fun! Lots of things to do. Plenty to do Christine, great destination for kids! I totally agree with your list! We dd all 3 of those too. 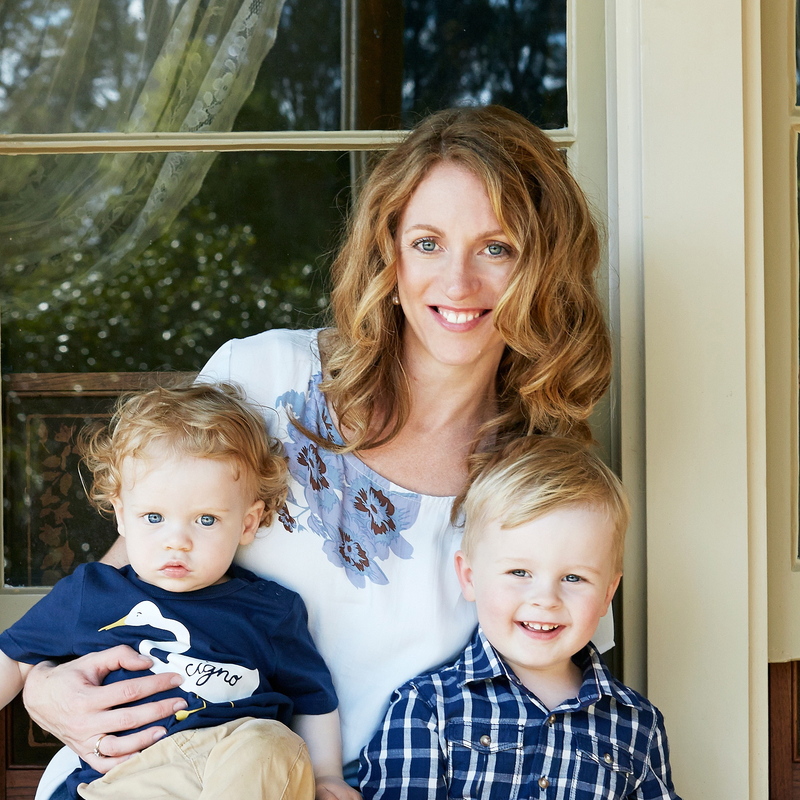 I think our day at Billabong Sanctuary was one of the best days we have had as a family. Even I couldn’t resist holding the Koala and having my pic taken. We were lucky as we were the last to leave and one of the rangers asked us to stay so the kids could help feed the kangaroos and birds and it was amazing to be the only family there. Reef HQ was great opportunity to see how much we need to take care of the reef and the turtles. Great post! 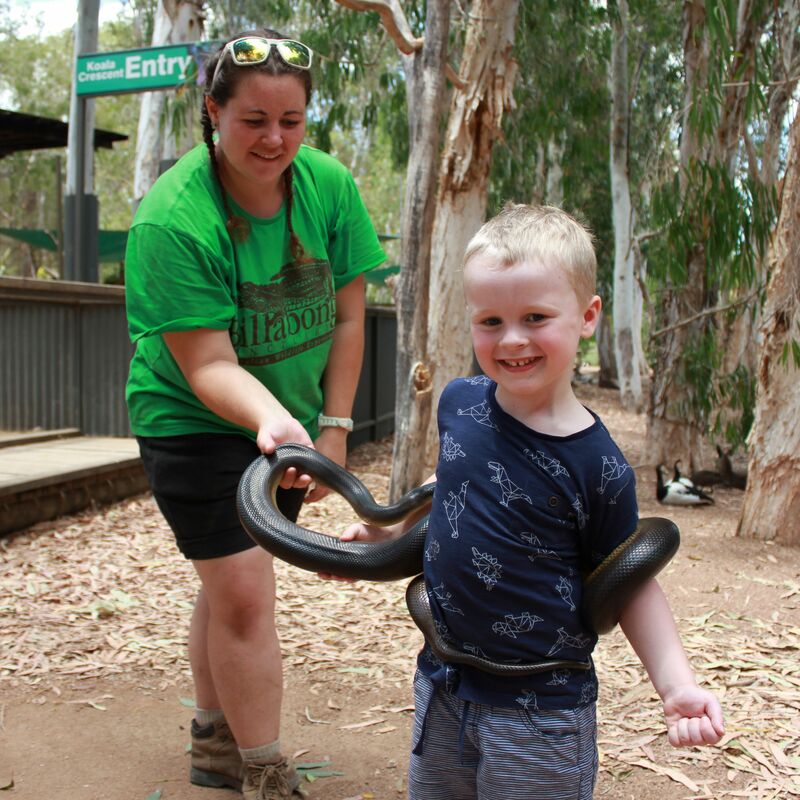 Oh thank you, what an amazing experience for your family at the Billabong Sanctuary!